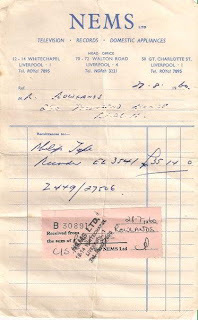 Liverpool Beatles Auction: NEMS Receipt. This item is quite interesting. It's a receipt from a NEMS store for a cassette recorder purchased in 1960. In fact when it goes up for auction on 28th August 2010 it will be exact 40 years and day old! The receipt it dated 27th August 1960. And the cassette recorder cost £35.14.